Home >> Articles >> Interview with Kris Wilder, Nicholas Yang, and Rory Miller about "Crossing the Pond Martial Expo 2010"
Interview with Kris Wilder, Nicholas Yang, and Rory Miller about "Crossing the Pond Martial Expo 2010"
YMAA Publication Center supported the inaugural "Crossing the Pond Martial Expo" held Aug. 14-15 in Seattle, and Aug. 21-22 in Coventry, UK. This expo brought together six well-known and highly-skilled instructors of martial arts and self-defense. YMAA Publication Center supported the inaugural "Crossing the Pond Martial Expo" held Aug. 14-15 in Seattle, and Aug. 21-22 in Coventry, UK. This expo brought together six well-known and highly-skilled instructors of martial arts and self-defense from across the United States and the United Kingdom. Workshops were held by YMAA authors Nicholas Yang, Kris Wilder, and Rory Miller. 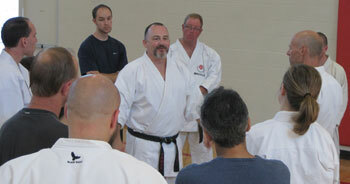 Other instructors featured in the expo were Al Peasland, Marc "Animal" MacYoung, and Iain Abernethy. We asked Kris Wilder, Nicholas Yang and Rory Miller to summarize their feelings after the event. YMAA: What was the best part of the Crossing the Pond Martial Arts Xpo? Kris Wilder: The best part of "Crossing the Pond Martial X-PO" was the wide array of skills and disciplines that the participants brought to the event. We had everybody from Kung-fu, Silat, Karate, to modern day Jeet Kun Do people show up to train. Training is not the right word when it comes to these kinds of events. I think a better term is exposure--exposure to what the instructors were teaching so that the participants could take what was taught back to their dojo or gymnasium and train and to integrate these techniques and principals into their art. That is the thing that I think is the greatest aspect of a multidisciplinary event like this, the exposure. Nicholas Yang: I was very happy to see so many martial arts practitioners of different disciplines and backgrounds meeting together to collaborate, to train with one another, and to make new friends. It was great to see traditional training alive and well in such a cooperative, supportive, and friendly environment. Everybody contributed to a very open and positive atmosphere. Students were eager to learn about each style, and everyone maintained a respectful and caring attitude towards both the instructors and other students. I was extremely happy to see none of that old-school competition and rivalry between schools, students, and instructors. There were no battles of dignity or ego. The best part of the X-PO was seeing exactly how much the different styles and backgrounds overlapped and resonated with each other in the training content, how much the instructors were all essentially teaching the same things, just in different languages. After the seminars, it was an extreme pleasure to be able to hang out with everybody outside of a training context — getting to meet new faces, share stories, talk about training, and have a drink together. Rory Miller: I really enjoyed meeting the other instructors and it was a pure pleasure to get to know the British contingent, but Kris Wilder is working on some cutting-edge stuff with power generation and structure that is really outstanding. YMAA: How do you see traditional arts fitting into this setting? Kris Wilder: I think the mixing of traditional and modern perspectives in regard to the martial arts is absolutely the path of the future. Let me explain what I mean by that. It is similar to when I walk by the weight room at the gym. I see these guys moving tons of weight all around and then I turn around and look in the other room across the hall and I see the yoga people all flexed out. The yoga people could use a little more weight training and the weight lifters could use a little more flexibility. I think martial arts are all about balance. This is what the modern exploration of the martial arts brings to the traditionalists, an unencumbered and empirical inversion of violence and its applications. The traditionalists bring a sense of decorum, respect, and responsibility to the arts. These two attributes are needed to make a complete martial artist. At the end of the day a complete martial artist is both internally skilled and externally skilled, they have a sense of themselves they know their limitations and responsibilities, and because of that they live a more rounded life. So that's why I think multidisciplinary events are a fantastic thing. Nicholas Yang: I consider all of the training from this X-PO to be traditional. I suppose you can say the more "modern" variations of this traditional training are the disciplines of self-defense and street-fighting. However, in my opinion, many of the techniques developed and used for these two disciplines still have a very solid tie and resemblance to the traditional arts. I was happy to see the old traditional arts of Karate and Chinese martial arts come together with some of their modern variants. As we dive head-on into the 21st century, I think it will become increasingly important to continue training together, working together, keeping an open mind, constantly improving upon the training, and adapting for today's generations. Rory Miller: Primarily, this WAS a traditional arts seminar... but with people who have played in a little more rough and tumble environment. I would say that what happened at the XPO was closer to the heart of traditional arts than most of what is taught as traditional arts. YMAA: What would you like to see in the Xpo next year? Kris Wilder: As for what I'd like to see next year, well, we are not sure that there really will be a next year for the X-PO. The entire event was conceived as a one-off sort of deal, not a yearly event. However, we did have people saying that they'd like to do it again next year. Enough people made these kinds of comments so that Iain Abernethy and I looked at each other and said, "Well, maybe we might want to do this, but let's review the event in early 2011 and see if we think we want to." There's an enormous amount of work that goes into this kind of event and then doing it on two continents complicates the process times 10, not to mention things like jet lag, travel, and just overall scheduling. Honestly, this sort of event makes me just question how a rock band can go out on the road for thirty or forty dates at a time, let alone do half of those dates on another continent. I have to say I have a new appreciation for roadies and road managers of rock bands. Nicholas Yang: All of us could have benefited from having more teaching time. The content was a bit rushed due to having only a one-hour class for two different groups on each day. It was a good sampler of the many styles and disciplines, but there was insufficient practice time. For many of the students, I imagine it was probably rather difficult to retain all the knowledge because there was just so much variety in the teachings throughout the five hours of each day. I hope to see a bigger turnout next year and perhaps a longer session. Next year, maybe we can coordinate between instructors to co-teach some of the sessions, giving the students more time to train the material taught. Rory Miller: More numbers, possibly a larger venue. It was great.